Boot Camp Marbella | The Concept of our Fitness Holidays. Boot Camp Marbella offers all-inclusive fitness holidays in Marbella, southern Spain, known for its superb all-year-round climate (with over 300 days of sunshine). First-class accommodation is provided and the ultimate in health and fitness training that is safe, effective and carried out by a team of experienced and qualified trainers. 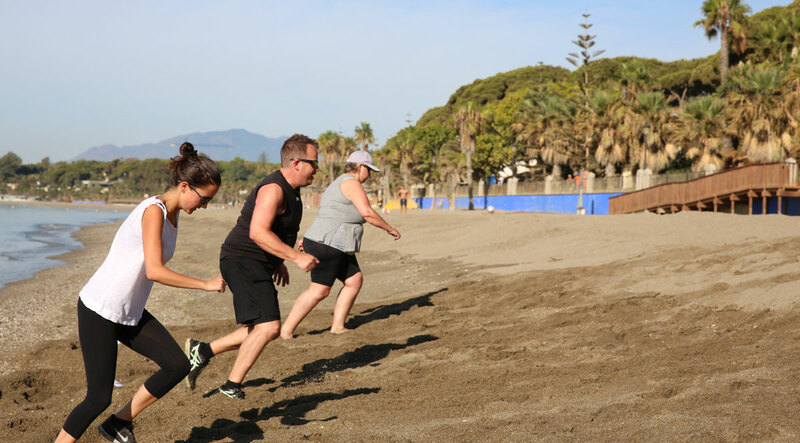 The strength of Boot Camp Marbella lies in the personal approach towards our guests, the beautiful mainly outdoor locations we use for the training activities and above all the variation of the programme. Our guests mainly come to us because they are looking for a lifestyle change, a fun fitness holiday and an intensive boot camp program to help them reach their target weight*, fitness goals and be inspired. Each day includes a range of group fitness activities that are both challenging and fun. The programme is designed for all fitness levels and ages. The team consists of energetic, qualified and caring people who will offer encouragement and support. Our philosophy is not to push you to the limits of exhaustion in a military style but rather to observe your ability, to inspire you and most importantly to keep it safe, fun, effective and injury free. (There is no camouflage gear in sight!). The team will coach the group with a keen eye on the needs of the individual and will provide tailored instructions for each guest on how to achieve their fitness goals. We offer the perfect formula for fitness; activity, relaxation and proper nutrition. All the elements needed for general wellbeing, good health and weight* management. When you leave Boot Camp Marbella you will have kickstarted your physical transformation and be inspired to lead a healthier lifestyle!